The trail in Skookumchuck Narrows Provincial Park is one of the most well known and spectacular hikes on the Sunshine Coast. At the end of the trail, hikers are rewarded with being witness to one of the largest tidal flows in the world. You just have to time it right! Hiking through Skookumchuck Narrows Provincial Park. The trail in this park is a nice, soft, 4 km forested path that is wide and forgiving, and not overly physically demanding. There are a few rolling hills and the occasional root and rock to clamber over. The trail passes through second growth forest, with interpretive signs along the way communicating the logging history of the area. Watching the tidal change in Skookumchuck Narrows Provincial Park. After about one hour of walking (4 km hike), you will reach Skookumchuck Narrows. Skookumchuck is a Chinook First Nations word meaning “strong water” and this area is home to one of the greatest natural spectacles in British Columbia. Twice daily, nature puts on a show as the tide changes and the flow of saltwater switches, reversing the direction and power of these incredibly turbulent rapids. The difference in water levels between one side of the rapids and the other sometimes exceeds 9 feet in height, with 200 billion gallons of water flowing through the Skookumchuck Narrows connecting Sechelt and Jervis inlets. The Sechelt Rapids are famous for their spectacular whirlpools and, for extreme kayakers and divers, “Skook” is one of the great white-water wonders of the world, attracting thrill-seekers from across the globe. Searching for sea life in the narrows. To view the rapids, you must time your hike right. Make sure to check out the tide charts and the Skookumchuck viewing times. The best waves are on the XL flood tide and viewed from Roland Bay, along the hiking route. Allow about 45 minutes to one hour each way on the trail. On the ebb tide, head for North Point, which offers the best viewing from an open rocky outcrop (with fencing for safety) to see the gurgling whirlpools. There is also an abundance of marine life along the shores. A variety of sea stars, urchins, crabs, sea cucumbers and all sorts of interesting creatures call Skookumchuck Narrows their home. Accessible sections of the trail in Skookumchuck Narrows Provincial Park. While incredible, the rapids get their name for a reason. Use caution when near the water, especially with small children and pets who should be under constant supervision during this time. The waters are for highly experienced paddlers, divers, and boaters only and are extremely dangerous. Drive north from Sechelt on Highway 101 toward the Earl’s Cove ferry terminal. Take a right on Egmont Road just before the ferry (you’ll see the signs for “Home of the Skookumchuck Narrows”). Follow Egmont Road approximately 6 km until you see the signs for the Skookumchuck Narrows Provincial Park on your right. There is a long row of parking along Egmont Road but it can get quite busy on summer weekends, so plan accordingly. Then just follow the signs from the parking area to the trail that is well marked. The trails of the Sunshine Coast offer a wide array of experiences for travellers of all levels and walks of life. Ranging in length, difficulty, and experience, the trails on the Sunshine Coast are the epitome of the pristine beauty and epic landscapes of British Columbia. Join the adventure and share your photos with us on Facebook, Instagram, Twitter, or YouTube using #sunshinecoastbc. 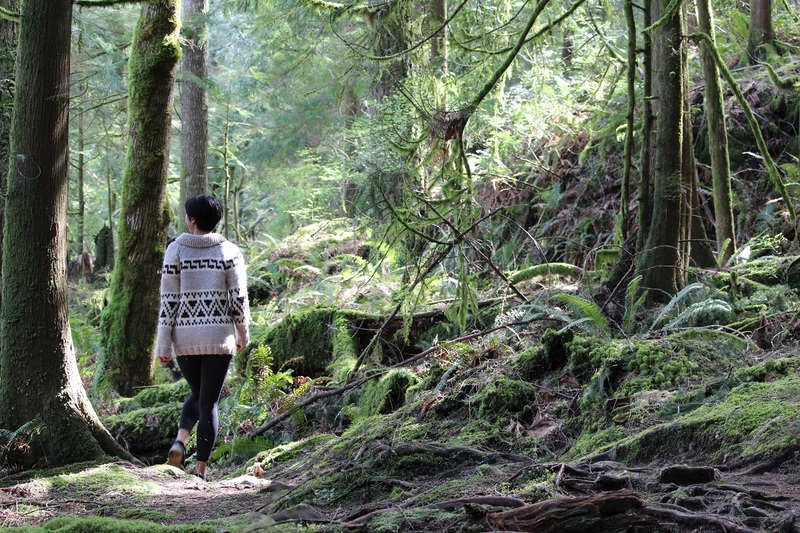 Head here for more information on hiking routes on the Sunshine Coast.